NEW ORLEANS — All-America honorees for the 2016 NCAA Division I Outdoor Track & Field season were announced Monday afternoon by the U.S. Track & Field and Cross Country Coaches Association (USTFCCCA). Student-athletes earned First-Team USTFCCCA All-America honors by virtue of finishing among the top-8 in their events, including as a member of a relay, at this past weekend’s NCAA Division I Outdoor Track & Field Championships in Eugene, Oregon at Historic Hayward Field. 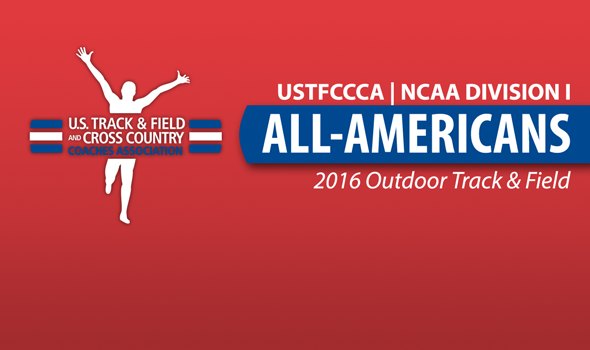 Second-Team All-America honors go to those who finish ninth through 16th and Honorable Mention is 17th through 24th. Team titles went to the Florida men and Arkansas women. It was the Gators’ third crown in the past five years (eighth podium finish in as many years) and the Razorbacks’ first-ever outdoor championship. When it comes to All-Americans, the Gators landded the most first-team honors out of all the men’s teams. Florida’s 16 led the way, followed by LSU with 14, Arkansas with 11 and Texas A&M with 10. The Razorback women had the fourth most first-team selections with 13, trailing the Gator women (15) as well as Southern Cal and the Tigers, both of whom had 14. Arkansas does have the most first- and second-team honorees combined (21) and that depth paid off in a big way last Saturday. Two athletes at the NCAA meet captured four All-America honors: Arkansas’ Jarrion Lawson and Southern Cal’s Deanna Hill. Lawson had a performance for the ages as he won the 100, 200 and triple jump. He became the first man in NCAA DI history to complete that triple since Jesse Owens in 1936. Lawson’s fourth All-America nod came as a member of the Razorbacks’ 4×100 relay team. While Hill wasn’t a national champion in any of the four events in which she contested, she was strong in her own right. Hill placed sixth in the 100, seventh in the 200 and was a member of the Trojans’ second-place 4×100 relay team and eighth-place 4×400 relay team. Six women earned three All-America nods compared to just three men. By conference, the SEC dominated once again. The SEC had 161 first-team honors, compared to 63 for the Pac-12 and 45 for the Big Ten. Look below for the full list of All-Americans separated by first and second team.